12th September 2017, New Delhi: The recent news of a 7-year old being murdered in a Gurgaon school, a 5-year old being raped in a Delhi school, both by school support staff, have sent chills down the spines of innumerable parents. And suddenly, many more scary incidents involving children at school are being reported from different parts of the country. Many parents in various circles on LocalCircles have said that they are concerned about the safety & security situation in their child’s school and this is an area that needs urgent attention. Many parents also said that there is virtually no security check for the support staff and it is very easy for them to carry what they want inside the school and enter most of the areas within the school. 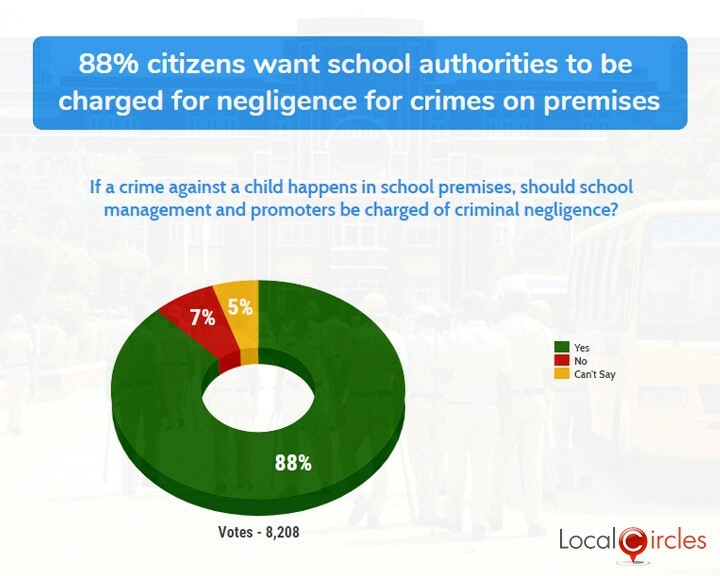 LocalCircles conducted a set of polls on these worrying issues and asked citizens if a crime against a child happens on school premises, should school management and promoters be charged for criminal negligence. Out of the 8,208 citizens who responded, a large 88% said that this should happen while 7% said it should not happen and 5% chose not to share their opinion. Various discussions in the circles have pointed out that in many schools, the school support staff like cleaners, drivers, conductors and peons do not have separate toilets. It is also seen that the accused in most of the incidents is a contract staffer. When asked the citizens if it should be mandatory for schools to have children’s toilets separate from staff toilets. 89% responded in a positive while 9% responded in a negative. 2% were unsure about it. A total of 8,256 votes were received on this poll. School is a place where children spend 4 to 8 hours every day and parents place a lot of trust in the school management to give the children the education but most importantly, keep them safe. 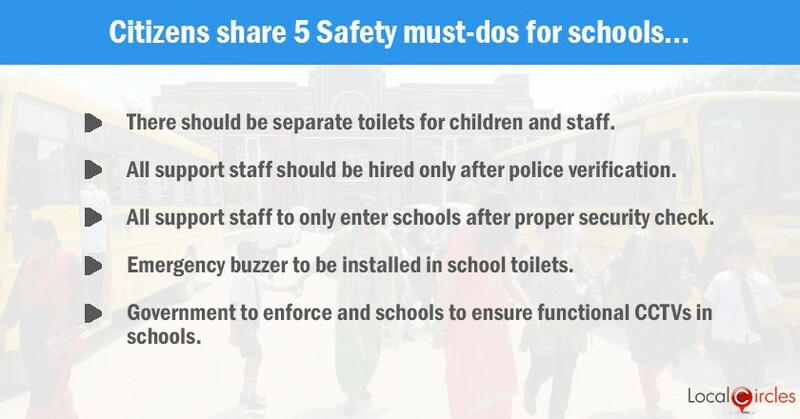 In various discussions on LocalCircles, people suggested that school should have strong CCTV surveillance, emergency buzzers in toilets and where possible, attendants should be placed outside washrooms. People said that the school should immediately respond to any complaint by the child or parents against any staff member and the school buses should have female helpers too. 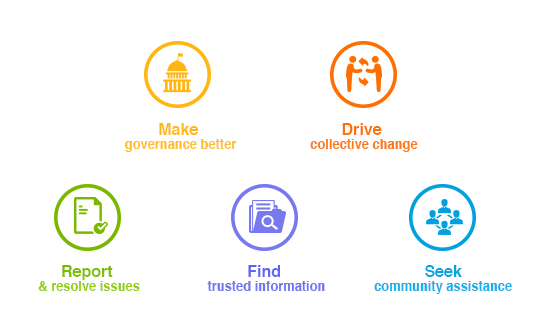 According to citizens, apart from school authorities, district administration via the district education officer, who is the connect between school and local authorities should also have a detailed process checklist of things to check when they visit a school to ensure its compliant. Key compliances should also include that no liquor or gutkha shop is operating in atleast 100 yards radius and no weapons are carried on school premises, said the citizens. Citizens have also suggested that no staff, permanent or temporary, should be hired without proper background and police verification but the police and local administration needs to make the process easier and faster. Also, some citizens suggested that the Parents Body of every school must become more active and raise red flags with local administration if school fails to comply within a defined timeframe.